I wasn’t sure what to expect. I’d heard that Berlin jazz audiences can let artists know what they think in no uncertain terms. Two years ago there was a fracas and walk out when the audience objected loudly to Kurt Elling’s performance with the WDR Big Band. In 1969 Cecil Taylor was famously booed by traditionalists. So how would the audience react to this year’s six-day programme of avant-garde jazz and free-form improvisation? 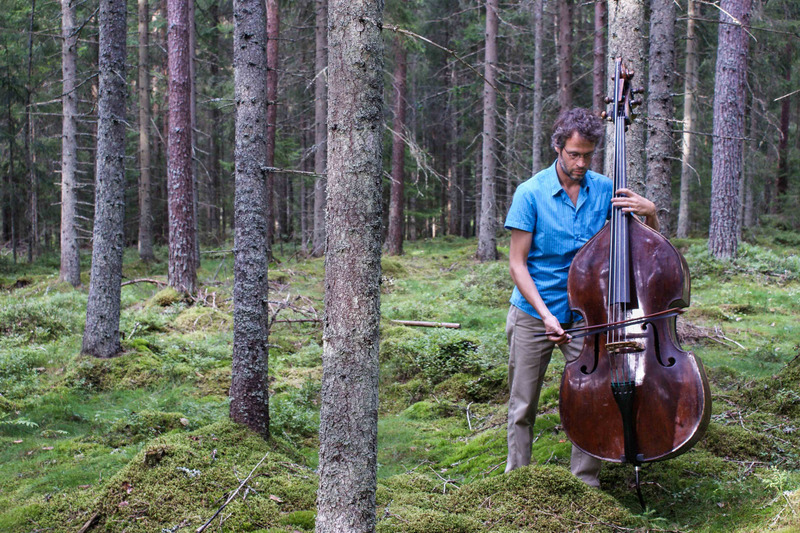 With Forresta, German bassist John Eckhardt temporarily puts aside the double bass for an excursion into soundscapes generated by electric bass guitar and accompanying live electronics. This new release represents a significant departure from Eckhardt’s Xylobiont, an excellent piece dedicated to exploring extended techniques and sound production for solo acoustic double bass. Where Xylobiont consists in an organic, directly tactile testing of the sonic limits of an unamplified instrument, Forresta turns instead to the sounds of an electric instrument once removed and enhanced through the creative use of loops and pedals. Although rooted in the bass guitar, the tracks on Forresta more often than not obscure the instrument’s fingerprints. Lower frequencies predominate—sometimes as a throbbing presence, sometimes as a heavily reverberant rumble–but higher-pitched sounds, like the chords floating over the ground of Subflora, the release’s longest and most developed track, appear as well. Throughout Eckhardt’s concern is not just with sound but with architecture; the fitting together of figures and motifs with strategically-placed silences, bursts of abstract sound or rhythmic ligaments shows a facility for creating coherent forms out of disparate parts. Not only does Forresta highlight Eckhardt’s musical sensibility, but its issuance as an edition of one hundred LPs, each individual unit of which has its own unique cover, allows Eckhardt to demonstrate his visual sensibility as a close-in photographer of forest flora. MATA presents its third annual MATA Jr. Festival in conjunction with the Kaufman Music Center’s teen new-music ensemble Face the Music, who will offer performances of newly composed music by seven pre-college composers selected from an international call for submissions. In preparation for the event, young composers were paired with MATA-alumni composer mentors Žibuoklė Martinaitytė (MATA 2008), Sam Pluta (MATA 2015), Alex Weiser (MATA 2015) and Face The Music’s Ian Munro. Pianist Lara Downes celebrates the release of her latest album, America Again, on Sono Luminus. The album’s title is taken from Langston Hughes’ poem, “Let America Be America Again,” written in 1938. America Again features nineteen pieces selected by Lara that explore the elusive but essential American dream, written by composers including Leonard Bernstein, Samuel Coleridge-Taylor, Duke Ellington, George Gershwin, Morton Gould, Lou Harrison, Angélica Negrón, Florence Price, David Sanford, Dan Visconti, and more. North/South Consonance, Inc. kicks off its 37th consecutive season with a concert on Monday evening November 14 featuring clarinetist Javier Vinasco and the Q-Arte String Quartet. They will performs recent chamber works written for them by Miguel del Aguila, Blas Emilio Atehortua, Celso Garrido-Lecca, and Andres Posada. Vocalist Theo Bleckmann takes on the mysterious songbook of British pop recluse Kate Bush. This project goes beyond merely re-creating Kate Bush’s music but taking it into other realms of sound and interpretation. Teodora Stepančić performs works for piano by Christian Wolff, Luciano Berio, Jürg Frey, and Assaf Gidron. During his four decades in the record business, Thomas Steenland has released dozens of albums, presenting world premiere recordings of over 160 works by more than 80 composers. He is the “one man army” behind the Starkland record label, which he founded in 1991. Steenland was also the first to explore presenting new music on leading-edge surround sound DVD-Audio recordings, commissioning 13 composers to create surround sound works for Starkland DVD-A releases.